Civilian control of the military is a doctrine in military and political science that places ultimate responsibility for a country's strategic decision-making in the hands of the civilian political leadership, rather than professional military officers. The reverse situation, where professional military officers control national politics, is called a military dictatorship. A lack of control over the military may result in a state within a state. One author, paraphrasing Samuel P. Huntington's writings in The Soldier and the State, has summarized the civilian control ideal as "the proper subordination of a competent, professional military to the ends of policy as determined by civilian authority". Civilian control is often seen as a prerequisite feature of a stable liberal democracy. Use of the term in scholarly analyses tends to take place in the context of a democracy governed by elected officials, though the subordination of the military to political control is not unique to these societies. One example is the People's Republic of China. Mao Zedong stated that "Our principle is that the Party commands the gun, and the gun must never be allowed to command the Party," reflecting the primacy of the Communist Party of China (and communist parties in general) as decision-makers in Marxist–Leninist and Maoist theories of democratic centralism. As noted by University of North Carolina at Chapel Hill professor Richard H. Kohn, "civilian control is not a fact but a process". Affirmations of respect for the values of civilian control notwithstanding, the actual level of control sought or achieved by the civilian leadership may vary greatly in practice, from a statement of broad policy goals that military commanders are expected to translate into operational plans, to the direct selection of specific targets for attack on the part of governing politicians. National Leaders with limited experience in military matters often have little choice but to rely on the advice of professional military commanders trained in the art and science of warfare to inform the limits of policy; in such cases, the military establishment may enter the bureaucratic arena to advocate for or against a particular course of action, shaping the policy-making process and blurring any clear cut lines of civilian control. The point of civilian control is to make security subordinate to the larger purposes of a nation, rather than the other way around. The purpose of the military is to defend society, not to define it. A state's effective use of force is an issue of great concern for all national leaders, who must rely on the military to supply this aspect of their authority. 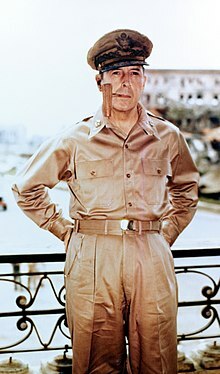 The danger of granting military leaders full autonomy or sovereignty is that they may ignore or supplant the democratic decision-making process, and use physical force, or the threat of physical force, to achieve their preferred outcomes; in the worst cases, this may lead to a coup or military dictatorship. A related danger is the use of the military to crush domestic political opposition through intimidation or sheer physical force, interfering with the ability to have free and fair elections, a key part of the democratic process. This poses the paradox that "because we fear others we create an institution of violence to protect us, but then we fear the very institution we created for protection". Also, military personnel, because of the nature of their job, are much more willing to use force to settle disputes than civilians because they are trained military personnel that specialize strictly in warfare. The military is authoritative and hierarchical, rarely allowing discussion and prohibiting dissention. For instance, in the Empire of Japan, prime ministers and almost everyone in high positions were military people like Hideki Tojo, and advocated and basically pressured the leaders to start military conflicts against China and others because they believed that they would ultimately be victorious. Many of the Founding Fathers of the United States were suspicious of standing militaries. As Samuel Adams wrote in 1768, "Even when there is a necessity of the military power, within a land, a wise and prudent people will always have a watchful and jealous eye over it". Even more forceful are the words of Elbridge Gerry, a delegate to the American Constitutional Convention, who wrote that "[s]tanding armies in time of peace are inconsistent with the principles of republican Governments, dangerous to the liberties of a free people, and generally converted into destructive engines for establishing despotism." In Federalist No. 8, one of The Federalist papers documenting the ideas of some of the Founding Fathers, Alexander Hamilton expressed concern that maintaining a large standing army would be a dangerous and expensive undertaking. In his principal argument for the ratification of the proposed constitution, he argued that only by maintaining a strong union could the new country avoid such a pitfall. Using the European experience as a negative example and the British experience as a positive one, he presented the idea of a strong nation protected by a navy with no need of a standing army. The implication was that control of a large military force is, at best, difficult and expensive, and at worst invites war and division. He foresaw the necessity of creating a civilian government that kept the military at a distance. In time of actual war, great discretionary powers are constantly given to the Executive Magistrate. Constant apprehension of War, has the same tendency to render the head too large for the body. A standing military force, with an overgrown Executive, will not long be safe companions to liberty. The means of defense against foreign danger, have been always the instruments of tyranny at home. Among the Romans it was a standing maxim to excite a war, whenever a revolt was apprehended. Throughout all Europe, the armies kept up under the pretext of defending, have enslaved the people. Hamilton and Madison thus had two major concerns: (1) the detrimental effect on liberty and democracy of a large standing army and (2) the ability of an unchecked legislature or executive to take the country to war precipitously. These concerns drove American military policy for the first century and a half of the country’s existence. While armed forces were built up during wartime, the pattern after every war up to and including World War II was to demobilize quickly and return to something approaching pre-war force levels. 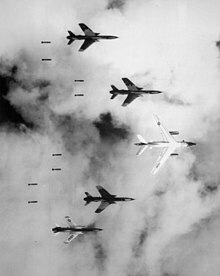 However, with the advent of the Cold War in the 1950s, the need to create and maintain a sizable peacetime military force "engendered new concerns" of militarism and about how such a large force would affect civil–military relations in the United States. The act is often misunderstood to prohibit any use of federal military forces in law enforcement, but this is not the case. For example, the President has explicit authority under the Constitution and federal law to use federal forces or federalized militias to enforce the laws of the United States. The act's primary purpose is to prevent local law enforcement officials from utilizing federal forces in this way by forming a "posse" consisting of federal Soldiers or Airmen. Maoist military-political theories of people's war and democratic centralism also support the subordination of military forces to the directives of the communist party (although the guerrilla experience of many early leading Communist Party of China figures may make their status as civilians somewhat ambiguous). In a 1929 essay On Correcting Mistaken Ideas in the Party, Mao explicitly refuted "comrades [who] regard military affairs and politics as opposed to each other and [who] refuse to recognize that military affairs are only one means of accomplishing political tasks", prescribing increased scrutiny of the People's Liberation Army by the Party and greater political training of officers and enlistees as a means of reducing military autonomy . In Mao's theory, the military—which serves both as a symbol of the revolution and an instrument of the dictatorship of the proletariat—is not merely expected to defer to the direction of the ruling non-uniformed Party members (who today exercise control in the People's Republic of China through the Central Military Commission), but also to actively participate in the revolutionary political campaigns of the Maoist era. The establishment of a civilian head of state, head of government or other government figure as the military's commander-in-chief within the chain of command is one legal construct for the propagation of civilian control. American presidents have used the power to dismiss high-ranking officers as a means to assert policy and strategic control. Three examples include Abraham Lincoln's dismissal of George McClellan in the American Civil War when McClellan failed to pursue the Confederate Army of Northern Virginia following the Battle of Antietam, Harry S. Truman relieving Douglas MacArthur of command in the Korean War after MacArthur repeatedly contradicted the Truman administration's stated policies on the war's conduct, and Barack Obama's acceptance of Stanley McChrystal's resignation in the War in Afghanistan after a Rolling Stone article was published where he mocked several members of the Obama administration, including Vice President Joe Biden. [the] principle of civilian control... embodied the idea that every qualified citizen was responsible for the defense of the nation and the defense of liberty, and would go to war, if necessary. Combined with the idea that the military was to embody democratic principles and encourage citizen participation, the only military force suitable to the Founders was a citizen militia, which minimized divisions between officers and the enlisted. In the United States the Hatch Act of 1939 does not directly apply to the military, however, Department of Defense Directive 1344.10 (DoDD 1344.10) essentially applies the same rules to the military. This helps to ensure a non-partisan military and ensure smooth and peaceful transitions of power. Political officers screened for appropriate ideology have been integrated into supervisory roles within militaries as a way to maintain the control by political rulers. Historically they are associated most strongly with the Soviet Union and China rather than liberal democracies. While civilian control forms the normative standard in almost every society outside of military dictatorships, its practice has often been the subject of pointed criticism from both uniformed and non-uniformed observers, who object to what they view as the undue "politicization" of military affairs, especially when elected officials or political appointees micromanage the military, rather than giving the military general goals and objectives (like "Defeat Country X"), and letting the military decide how best to carry those orders out. By placing responsibility for military decision-making in the hands of non-professional civilians, critics argue, the dictates of military strategy are subsumed to the political, with the effect of unduly restricting the fighting capabilities of the nation's armed forces for what should be immaterial or otherwise lower priority concerns. The "Revolt of the Admirals" that occurred in 1949 was an attempt by senior US Navy personnel, to force a change in budgets directly opposed to the directives given by the Civilian leadership. U.S. President Bill Clinton faced frequent allegations throughout his time in office (particularly after the Battle of Mogadishu) that he was ignoring military goals out of political and media pressure—a phenomenon termed the "CNN effect". Politicians who personally lack military training and experience but who seek to engage the nation in military action may risk resistance and being labeled "chickenhawks" by those who disagree with their political goals. Nuclear weapons in the U.S. are controlled by the civilian United States Department of Energy, not by the Department of Defense. During the 1990s and 2000s, public controversy over LGBT policy in the U.S. military led to many military leaders and personnel being asked for their opinions on the matter and being given deference although the decision was ultimately not theirs to make. Other countries generally have civilian control of the military, to one degree or another. Strong democratic control of the military is a prerequisite for membership in NATO. Strong democracy and rule of law, implying democratic control of the military, are prerequisites for membership in the European Union. 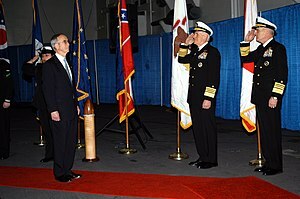 ^ a b Taylor, Edward R. Command in the 21st Century: An Introduction to Civil-Military Affairs (pdf), United States Navy Postgraduate School thesis. 1998: 30-32. ^ a b Kohn, Richard H. An Essay on Civilian Control of the Military. 1997. ^ Peter D. Feaver. 1996. "The Civil-Military Problematique: Huntington, Janowitz and the Question of Civilian Control." Armed Forces & Society. 23(2): 149–78. ^ "Kohn: Civilian Control". Unc.edu. Retrieved 2015-12-11. ^ a b c Cairo, Michael F. Democracy Papers: Civilian Control of the Military, U.S. Department of State International Information Programs. ^ Gottfried Dietze. 1960. The Federalist: A Classic on Federalism and Free Government. Baltimore: The Johns Hopkins Press. ^ Max Farrand. 1911. Records of the Federal Convention of 1787. New Haven: Yale University Press. 1:465. ^ Donald S. Inbody. 2009. Grand Army of the Republic or Grand Army of the Republicans? Political Party and Ideological Preferences of American Enlisted Personnel. Faculty Publications – Political Science. Paper 51. ^ Mao Zedong, English language translation by Marxists.org. On Correcting Mistaken Ideas in the Party. 1929. Janowitz, Morris. The Professional Soldier. Free Press, 1964, ISBN 0-02-916180-0.